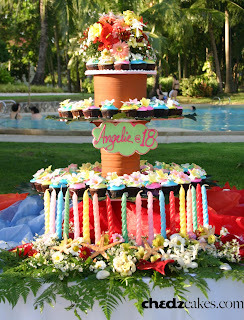 This was Angelie's debut cake made up of 150 cupcakes. We arranged it in a cakestand made of pots. The cupcakes were covered in bright pink, blue and yellow icing. 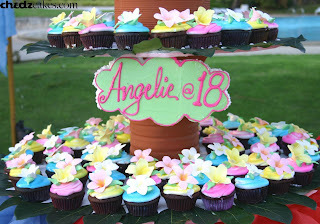 Each cupcake was topped with a kalachuchi or frangipani sugar flower. On top is a fresh bouqet of flowers. Then we arranged her 18 candles (in rainbow colors) at the bottom of the cake.